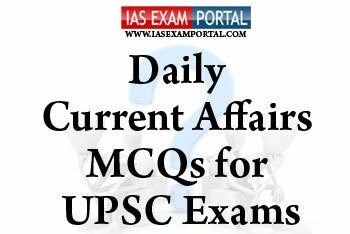 Current Affairs MCQ for UPSC Exams - 7 August 2018 | IAS EXAM PORTAL - India's Largest Community for UPSC Exam Aspirants. Q1. Which of the following regarding recently introduced “Start up academia alliance” program are true ? 1) Aims to reduce the gap between scientific research and its industrial applications in order to increase the efficacy of these technologies and to widen their impact. 3) Emphasis is placed on finding startups that employ innovative solutions to pressing problems in diverse areas. 1) MsMe’s are to get affected more than large exporters. 2) Cost of funding imports to get higher. 3) Government fiscal deficit to widen . a) The Eurasian Plate, Pacific Plate and Indo-Australian Plate are three active tectonic plates that cause the subduction zones. b) its location in the Pacific Plate, The North American Plate, The Eurasian Plate&Philippine Sea plates. d) the heavy frequent torrential down pours. Q4. Which of the following statements regarding attorney general of India are not true ? 1) heis the Indian government's chief legal advisor, and is primary lawyer in the Supreme Court of India. 2) he holds office during the pleasure of the president of india. 3) he also posseses executive authority in matters of supreme court like his American counterpart. Which of the above options are correctly matched ?